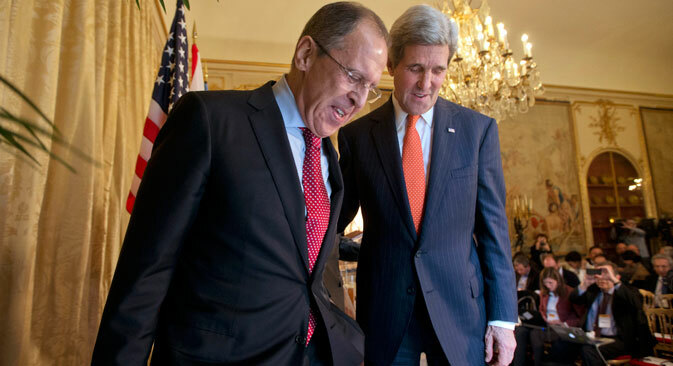 Russian Foreign Minister Sergei Lavrov and U.S. Secretary of State John Kerry are expected to meet on the sidelines of the UN General Assembly in New York on Sunday, the Russian Foreign Ministry's information and press department reported on Sept.25. "Such a meeting has been set for Sept. 27," it said. Russian Foreign Ministry spokesperson Maria Zakharova said on Sept.24 that Lavrov plans to attend a ministerial meeting of the Middle East Quartet on the sidelines of the United Nations General Assembly and to take part in a number of other ministerial formats. "Sergei Lavrov will traditionally attend meetings of foreign ministers in multilateral and regional formats, in particular, a ministerial meeting of the CSTO (Collective Security Treaty Organization), BRICS (Brazil, Russia, India, China and South Africa) and the international quartet of the Middle East peace mediators," she said at a press briefing in St. Petersburg. On Sept. 27, the minister will speak at the summit on the global development agenda post-2015 and will also meet with UN Secretary General Ban Ki-moon, Zakharova said. On Oct. 1, Lavrov is planning to hold a press conference on the results of Russia's presidency at the UN Security Council in September, she said. It was also announced that Russian President Vladimir Putin and his U.S. counterpart Barack Obama will meet in New York on Sept. 28.